The former Southampton centre-back cannot wait to get started at the Reds following his world-record £75m move from Saints. VIRGIL VAN DIJK has described Liverpool as the perfect match for him after his world-record move from Southampton was finalised. The Netherlands centre-back is now the most expensive defender in football history thanks to a £75 million switch from St Mary’s to Anfield. And he is hopeful that he will be able to properly showcase his talents under Jurgen Klopp on Merseyside. “I am happy to be here and I can’t wait to get started,” Van Dijk told Liverpool’s official website. “I think the most important thing is the size of the club, the culture of the club, the players, the manager and obviously the fans, who make the club this special. The 26-year-old looked on from the stands as a Mohamed Salah brace sealed a 2-1 win for Liverpool over Leicester City on Saturday and he is looking forward to sampling the Anfield atmosphere from the pitch. “I think it’ll be something special,” he said. “I think Anfield is a very special stadium and it is my home right now as well. 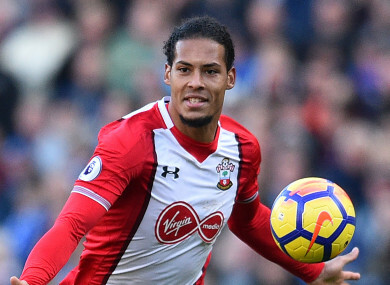 Email “Van Dijk delight over 'perfect' Liverpool switch”. Feedback on “Van Dijk delight over 'perfect' Liverpool switch”.